The cold had a certain warmth to it. Worlds, life, among the layers of ice. Complex sounds, alive, found in the darkest rocks, wet with winter’s water. These hollows, rough with age, nature’s hideouts, were the source of inspiration and sounds for the first full-length collaborative effort from Seaworthy (Cameron Webb) and Taylor Deupree. Webb was plucked from a bushfire and flood-ridden east coast of an Australian summer and deposited via a 20h flight into a New York covered in snow. From wetlands abuzz with wildlife in the Australia to winter’s wooded trails through Pound Ridge, the sonic environments couldn’t have been more different. Working together in person has been an important point in Deupree’s collaboratinos lately. Much preferring the human interaction and local landscapes over the soulless exchange of sound files over the internet. With this point taken care of the pair struck out in a New York February to a 4,000 acre nature preserve near Deupree’s studio called Ward Pound Ridge, a park rich in history that supports a diverse range of plant and animal life. While the cold of winter kept most of the animals quiet the landscape nonetheless teemed with sounds. The local environment was hit badly by Hurricane Sandy a few months prior and the remnants of broken trees and debris littered much of the woodland area. Deupree and Webb spent three days on the trails recording sounds and images which created direction and purpose for their album which was composed in the evenings in the 12k studio. The resulting Wood, Winter, Hollow traces a rustic path of the days in the woods with an equally natural soundset fronted by Webb on a nylon string guitar. 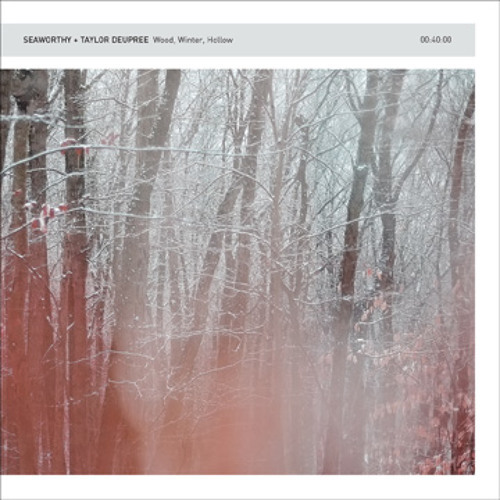 Bells, sticks, melodica and the occasional analog synthesizer form the sonic backdrop echoing the quiet, but lively sounds of the winter forest. Endemic field recordings, including hydrophones placed in near-frozen streams, became an integral part of the work creating a subtle narrative that places the album in its specific place in time. The subtle crackle of a slow flowing creek working its way through a cover of ice and frozen leaves. The faint whistle of the pale leaves of the beech tree that defy mother nature by clinging to their tree’s spindling branches against the push of winter winds. The cacophony of whispered raindrops running off infrastructure and hundred year old stone structures. These are the sounds that inspire and infuse Wood, Winter, Hollow. The rawness of winter in a world clinging to fragments of warmth. I can also hear Snow Falling on the Cedars. Is it intentional for the pitch to alter low to high quickly, almost erratically yet melodic. I almost hear Norwegian Wood, by the Beatles in this, in a quirky sense of the wood. This sounds like it'd be great in a soundtrack for a movie.